Your beautiful ranches at the foot of the mountain and the seaside are in danger! Being well taken care of, the ranches bear plentiful fruits and vegetables. One day a sounder of evil boars head towards your ranch to steal all of your livestock. Led by their big boss, a troop of evil boars will continue to attack. Their varied types and great skills make them highly dangerous. Defend your ranch as best as you can and prevent the evil boars from taking it over. Test your skills and collect plant weapons to defend your ranch! Battle Ranch is rated 3.2 out of 5 by 19. Rated 5 out of 5 by moonflower994 from Exciting! Farming was never so risky and challenging! Give this game a try and see what you think.Definite buy for me! 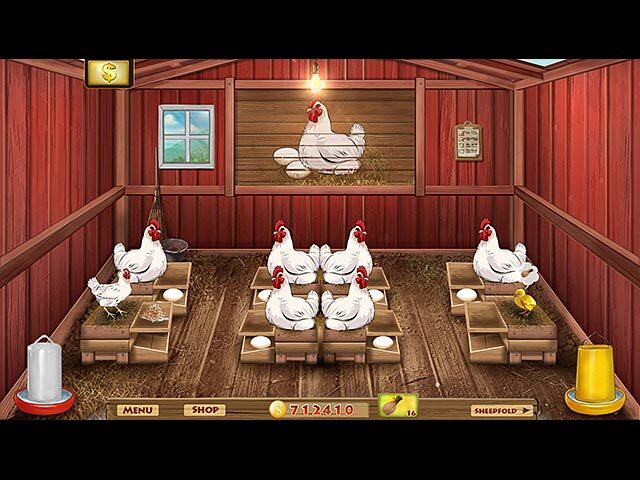 Rated 5 out of 5 by merypeach from YES it CLONES This game is very interesting to play, the combination features of ranch menagement and defense make you trained to be alert and set the best strategy to defeat the pigs. This game also has a story in the video clip + EXTRA LEVELS that does not exist in similar games. Yes it clones but Does not matter as long as the game has a certain characteristics and improvements. This is a REALLY NICE CLONE! 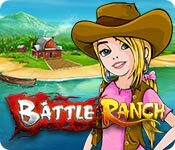 Rated 5 out of 5 by eagle009 from Battle ranch is an incredible game If we play carefully and properly explore the game then we can actually enjoy this game. This game is really fun. The game has a rich variety of gameplay and content that makes you will not get bored playing it. This game hooked me. I suggest you to play deeper to enjoy the game. I really recommend this game. Rated 5 out of 5 by LanaPook from Good game! I don't understand the low rating of this game. it is fun, challenging, unique enough, and has lots of levels. Yes it is like Plants VS Zombies which is the best ever... but this game has real merit. I hope you will give it a try. Rated 5 out of 5 by MetaCross from Fun and Chalengging Game Very beginning, I think this game is mediocre. Did not think to try to play any further. But after I played 40 minutes of me getting challenged, pass an hour I decided to buy this game. True this game more challenging the farther played. Rated 5 out of 5 by pennmom36 from When Pigs Attack! A sounder of evil pigs are after your farm animals....ohh nooo! Not to worry those veggies are ready to defend the livestock. 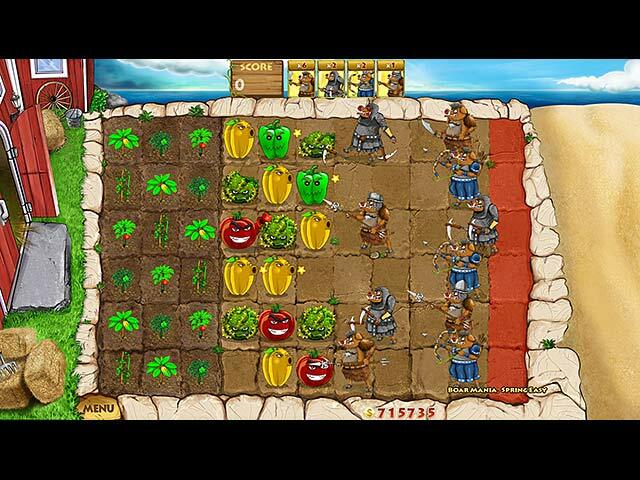 The goal of this game is to plant veggie seeds, some of the produce is worth more money than others, water the seeds and then harvest the plants, You use the money you earn to purchase different veggie defenses, some spit seeds which over time will injure the pig until he's dead, there is a green pepper bomb which explodes in three sections when placed, a hawthorns shield which temporarily blocks the enemy as well as injures him every time it's touched and the more you progress, the more defense veggies you receive. You also get bonuses such as cages which can be used to trap the pigs after they breach the veggie perimeter. There are different types of pigs as well such as sword boars, and arrow boars, the further you progress the more aggressive the boars become. 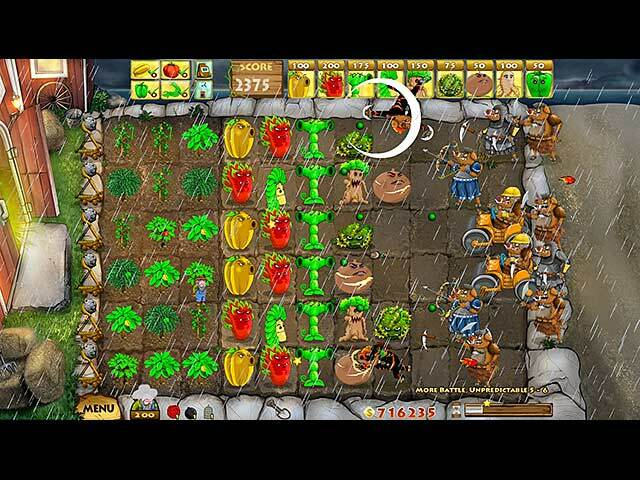 There are battle modes (mini games) where the veggies are already grown you just need to harvest the veggies when they are ready and with every 100 points earned you click on a button to release another random veggie defender as a continuous flow of evil boars attack. I actually liked this mode better because it was faster. There is a strategy guide for each level that will show you how you are supposed to set up the veggie defense step by step if you are having trouble finishing a level or not sure what to do. There is a good tutorial that explains everything, but it's a fairly simple strategy game that will have you hooked in no time at all, enjoy! Rated 4 out of 5 by kidsndogs from Great Game This was a good game - lots of levels and pretty challenging right away (not so many 'cheesy' levels). The only problem I had was it kept crashing my Windows 8 video driver - do definitely do a windows update if you're running 8. Rated 4 out of 5 by GabeMic from Good game I almost finish all the levels in this game. Although this game is basically similar to Plants vs. Zombies, but this game is really challenging and exciting. I recommend you to try this game. It is really fun and worth a try. Rated 4 out of 5 by Marcie28018 from A New Plants vs Zombies A new twist to farming and plants vs zombies. Get um before they get to your barn and steal your animals. Can't wait for a new Plants vs Zombies but this will do until one comes out. Has lots of instructions so no problems playing the game. Rated 4 out of 5 by ElizabethR1533 from It's fun enough I have played the game for 40 minutes in demo. The game is very similar to Plants Vs Zombies, although lacks the charm and humour that PvZ has. You plant seeds (instead of suns), and collect the fruit produced to gain points to buy weapons to shoot at the enemy. The enemy are pigs dressed up as various pirates or bandits, it seems. The graphic of the girl in the cowboy outfit seems to bare no resemblance to the game itself, unless I missed something in the introduction. It's enjoyable enough, and it's a welcome change from the week upon week of HOG and M3 games. It seems harder than PvZ so far, but not ridiculously hard like some of the TD games around. Some of the weapons are amusing enough, but I CANNOT work out how the "cages" work! Nothing happens when I click on them, then on the pig. The game is fun enough, and I will probably buy it after the demo is over.